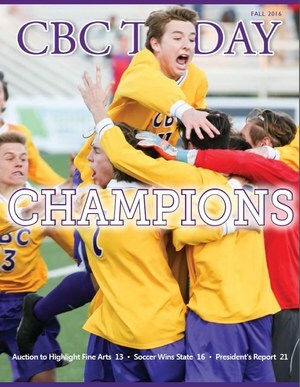 Check out the latest edition of CBC Today! Articles include a celebration of our ninth soccer state championship, a look back at the CBC Fire of 1916 and Class of 1956 alum Fr. Bob Gettinger's service to people of North St. Louis. Click the PDF link below to read this edition of CBC Today. A second link includes the 2015-2016 President's Report of Donors. CBC Today mails twice each year. If you would like to be added to our mailing list, please send your address to Communications Director Patrick Walsh at walshpatrick@cbchs.org.